In the US, the hip implant class action law suit against the pharma major began in 2011. Two years later, in 2013, the firm agreed to pay an estimated $2.5 billion to settle thousands of lawsuits from affected patients. While the lawsuits filed in the country’s top consumer court against Johnson & Johnson for its faulty hip implants drag on, the firm’s main defence in at least two such cases has been that the demands of Indian patients are “unreasonable and undue” as they approached the forum after getting to know of a $2.5 billion settlement by the firm in the United States a year earlier. In response to a petition filed by 52-year-old Jyoti Sharma, who moved the National Consumer Disputes Redressal Commission (NCDRC) in 2016 suing Johnson & Johnson for Rs 2 crore in damages, the firm filed an affidavit in July 2016 before the consumer court saying, “On failing to approach this honourable commission in time, the complainant has sought to now approach this forum as afterthought and with a view to make unreasonable, undue and wrongful windfall gains probably after getting to know about the USA settlement programme of Johnson & Johnson,” states the affidavit filed by the company in India. Sharma underwent a hip replacement surgery in New Delhi in September 2006. She claims she visited the hospital on multiple occasions complaining of pain, but wasn’t informed about the global recall. Early 2011, when her doctor advised her to undergo tests to determine the cobalt-chromium level in the blood, they found that her cobalt levels were as high as 3.69, she says – the normal range is between 0.08 and 0.09. She says she was first informed of the global recall in March 2012 after which, in June 2012, her implant was removed and she underwent a revision hip replacement surgery. When the pain persisted, Sharma says, she moved court. “The first communication I received from Johnson & Johnson was in March 2012. This was two years after the global recall. But despite the revision surgery, the fact remains that it has caused me irreparable, long-term damage to my hip bone and tissue. There was no move by the company to compensate me for the pain that I have suffered and will suffer in the future. Therefore, I decided to sue the company for damages for pain and suffering,” Jyoti says. Rebutting the charges in her petition, the firm has told the NCDRC that Jyoti “had the liberty” to approach the commission anytime between 2006-2012, when she was in pain from the operation and the implant, but did so only after the US settlement. “Only in 2012 did the complainant raise any allegation… while failing to do so for almost five years. On failing to approach the commission in time, the complainant has sought to now approach this forum as an afterthought and with a view to make unreasonable, undue and wrongful windfall gains, probably after getting to know about the USA settlement programme of Johnson & Johnson,” the firm told NCDRC. In fact, it has further said it was not liable to pay any compensation as the implant had been removed in June 2012. “It is pertinent to note that the cause of action failed once the subject hip implant was removed from the complainant in June 2012…The determination of complex, technical and controversial facts would require laying and establishing detailed, exhaustive technical, medical and scientific evidence led by the parties with examinations and cross examinations which are beyond the scope of the Consumer Protection Act” the firm told NCDRC. Sharma says the company was adding “insult to injury”. “The complaint was filed in 2016 with the hope of holding J&J accountable. It is now seeking to get away on the technicality that I filed the law suit too late. I approached a US law firm as early as March 2013, when I heard about the recall. One of the law firms, in fact, agreed to take up the case. Emails were exchanged about my surgery. But later, I was informed that I could not sue them in the US. Hence, I decided to approach Indian courts. 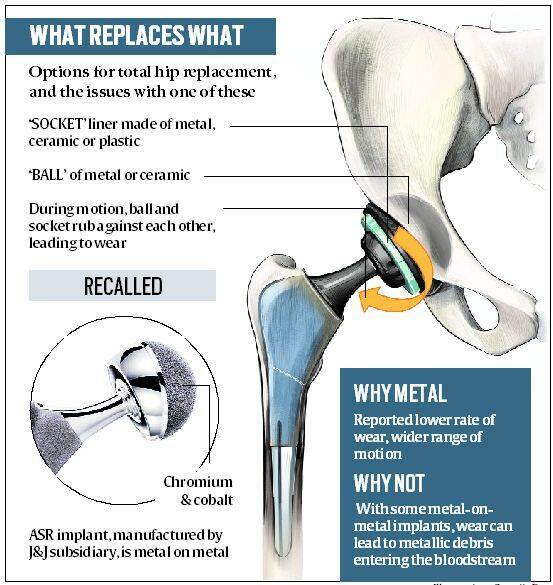 The reason given by Johnson and Johnson to the court is unbelievable, especially when it has agreed that ASR (articular surface replacement) implant was faulty and paid for my revision surgery to remove the faulty hip implants,” says Sharma. The pharma company had a similar response to a case filed by Purni Devi Goenka in 2014. Though Purni Devi died on March 11 this year at age 80, her son Arun Goenka continues to fight the legal battle in the consumer court. In this case, too, Johnson & Johnson said that the patient citing the US settlement is “not relevant” and that it was being used to “prejudice” the consumer forum. Purni Devi underwent a hip replacement surgery in March 2006. Her son says she was in pain for years after the surgery and, in August 2009, they found that the implant “had broken into two pieces”. “This was the reason for her pain. But we could not conduct a revision surgery because the doctors said it was too risky to implant a new hip system. As a consequence of prolonged agony of 12 years, because of the faulty implant, she developed associated problems and died of severe complications,” Goenka says. But the firm’s reply to the forum said the complaint was “vague, baseless and incorrect”. “It is submitted that the allegations of the complainant are vague and baseless in as much as no co-relation can be drawn between her alleged mental and physical pain and the implant,” the firm told NCDRC. “It is submitted that the complainant has, without knowing the details and facts of the settlement agreement, sought to use the same to prejudice this forum. It is submitted that there are several conditions such as age, medical profile, type and duration of use of hip implants that are applicable for determining the eligibility for receiving compensation under the settlement arrived by DePuy (Deputy International Limited, UK, a subsidiary of Johnson & Johnson) with the specified eligible claimants in the US,” the affidavit went on to say. The firm also told the consumer forum that the patient had “waived her right” to receive a revision surgery. “When we admitted her 2009, the investigation revealed that it was a case of total failure of hip replacement. But the doctors said revision surgery in her case would be risky. Why should the firm decide if the patient wants to undergo another painful revision surgery (to be eligible for compensation)? The argument of the firm is completely baseless,” says Goenka.